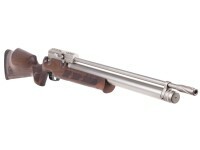 Includes: 2 magazines, single shot tray (in the .177 and .22 only. ), and fill probe. *Weaver rail is not standard, and we do not recommend using Weaver mounts. 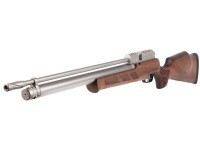 The Kral Arms Puncher Mega Marine PCP sidelever air rifle is a feature rich, competitively priced Turkish repeater. Featuring a nickel sidelever this smooth shooting PCP is ideal for backyard target accuracy and pest removal. The magazine boasts a high capacity spring-driven design. You get 14 (.177) rounds, 12 (.22) rounds and 10 (.25) rounds respectively. Each gun comes with 2 magazines, so you can keep shooting and spend less time reloading. Make the most of your available air in the 330cc cylinder as the Mega Marine is capable 50 to 60 shots per fill. 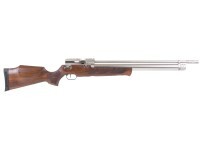 This gun easy on the eyes with its Turkish Walnut Monte Carlo stock and nickel sidelever. This version includes a sleek silver finished action. The stock's checkered forearm and pistol grip help you keep a tight hold. Add the included 2.5” Weaver rail to the forearm to accept a bipod or sling. Choose between unshrouded or shrouded, based on your need for quiet shots. Things I would have changed: This was rated at same noise level as my coyote. It is loader. Would put some type of baffling in shroud to quiet it down. What others should know: Be prepared for a pretty good crack when you first shoot it. Things I liked: Fit and finish. 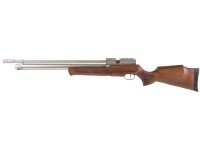 The wood on the rifle, smooth cocking, no play in the action at all. Things I would have changed: A little too heavy. What others should know: All I can tell you about is my one rifle, I read and watched every review I could before pulling the trigger on this. Some said the stock would need some work, and the action felt "workman like", With my rifle I could not disagree more, the fit of the rifle is fantastic, the action is smooth and firm, no wiggle in the action just fantastic. The wood on the stock some said you are going to refinish it...I bought it planning on doing stock work...it is not needed, in fact I don't want to...it is just too pretty. Still working the rifle in, get a flyer now and then but, at 60 yards I am happy with the groups, at 100 yards, I hope it will settle in, as the groups open more then I would like, but I only have about 100 pellets in it so far. Getting about 30 good 100 yard shots before things open up, at 60 yards I get 4 mags before I refill, I could get a few more, but you are reloading so why not fill up. I can't speak highly enough about it....very happy. Things I would have changed: Make it lighter. Do the unshrouded varients come with a 1/2 unf thread? The barrel itself is threaded under the shroud. Is there a 1/2 x 20 threaded end on the barrel under that choke? Both the unshrouded and shrouded versions are rated at a loudness level of 3. Is the shrouded really not any quieter than the unshrouded? 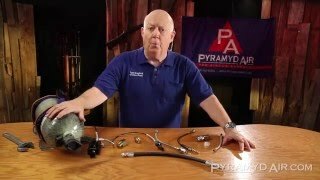 What are the approximate FPS and shout count of the .25 with the power adjuster turned all the way down? I don't think the website changes between the two, but there is definitely a difference in noise. I'd put the unshrouded version at a 4. Last time I tested one, with 25.4 grain JSB, adjusted all the way down, you're looking at the 400 fps range and over 80 shots. It's been a while since I tested one though.